Animation Insider is a site whose mission is to "focus on the real people in the trenches who make the award winning stuff we love. " The good news is that there are a great many interviews on the site, focusing on people who don't normally get coverage. The bad news is that the questions are standardized, so all kinds of opportunities for follow up questions are missed. Still, the site is a good place to discover the varied backgrounds and sensibilities of the people who earn their livings in animation. Here's a link to an alphabetical listing of interview subjects. Fresh from his appearance at the Ottawa International Animation Festival. I will be at the Ottawa Animation Festival from sometime Friday afternoon until Sunday afternoon. On Saturday at 1:00, I'll be on a panel called Web Portfolios with Richard O'Connor of Ace and Son Moving Picture Company and Brooke Keesling of The Cartoon Network. Stop by and say hello if you're there. Most animation fans are familiar with the sequence in Anchors Aweigh where Gene Kelly dances with Jerry, the mouse from Tom and Jerry cartoons. 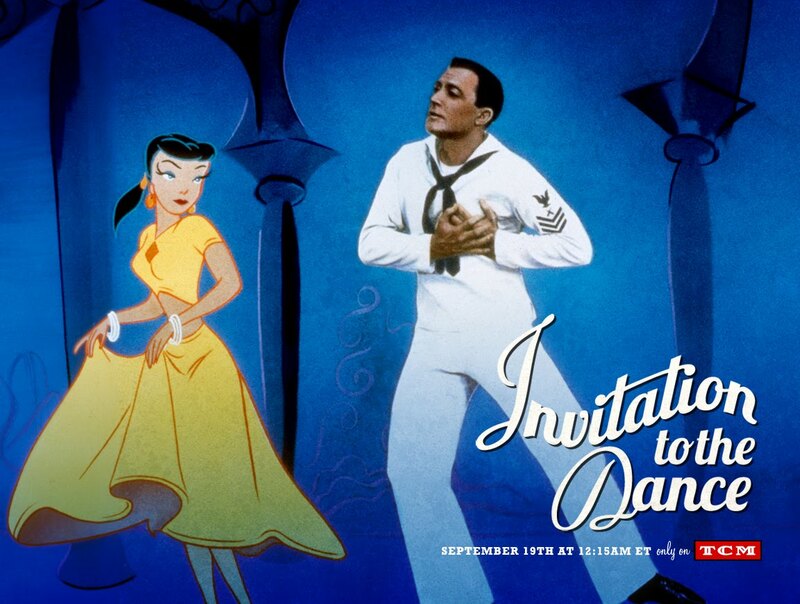 Fewer fans have seen Invitation to the Dance, a feature spearheaded by star Gene Kelly which consists entirely of three dance sequences. The last sequence is "Sinbad the Sailor" and features Kelly dancing with animated characters produced by Hanna Barbera while they were still at MGM. The film will be showing on Turner Classic Movies early in the morning of Tuesday Sept. 20 at 12:15 a.m. Eastern Time. Or if you prefer, late Monday night. In any case, TCM only runs the film every few years, so you might want to catch it if you're interested. Below is an excerpt from the animated sequence. I Have An Idea for an Animated Film. Can You Make It For Me? Steve Bissette, a comics artist who also writes and publishes, has posted a great piece on issues surrounding collaborating on a graphic novel. The piece is relevant because the requests that Bissette is addressing are similar to those that I regularly address as the coordinator of Sheridan College's animation program. I am constantly fielding phone calls and emails requesting that students create films for individuals and organizations. As Bissette points out, like it or not, drawing takes longer than writing. And animating most certainly takes longer than writing. My first question when I get these requests is to ask if this is a paying project. Most times it isn't. In that case, my response is that we have a highly structured curriculum and we're not able to accommodate the request. If the job is paying, I try to connect a recent graduate with the project. 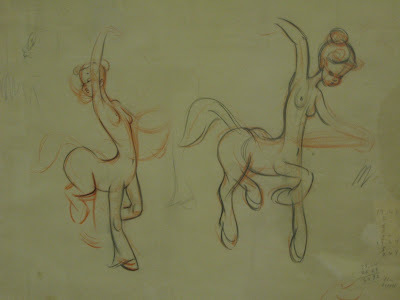 I don't doubt that many animation artists get requests like this. I remember somebody who wanted an animation done for her daughter's birthday party with a caricature of the mother as the main character. I think the fee on that was as high as $100, but when I quoted industry rates, that ended the discussion quickly. People generally don't understand how labour intensive drawing and animating are. They also assume, as Bissette points out, that artists are devoid of ideas, just sitting around waiting for somebody to give them one. The problem is never finding an idea, it's finding the time and money to work on an idea. Bissette raises a lot of issues concerning ownership, royalties, etc. which are food for thought for anybody who is hired to collaborate, as opposed to simply being hired to execute. While the issues surrounding graphic novels and animation don't match exactly, there are enough in common to make the piece worth reading. Kim Deitch, son of animator Gene Deitch, has been writing an autobiography of sorts at The Comics Journal site. This installment mixes comix, music and animation into a gumbo that features animators Sally Cruikshank, Tony Eastman, Gene Deitch, and comix artist R. Crumb. 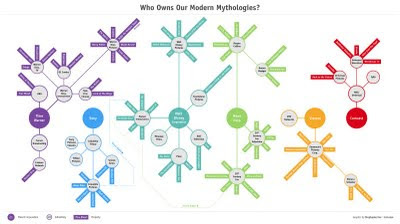 Who Owns Our Modern Myths and Legends? 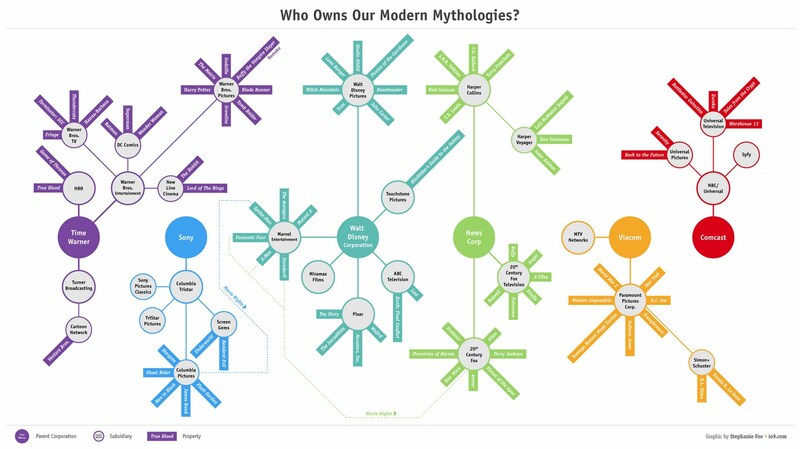 Charlie Jane Anders at io9 has put together this chart showing how six large corporations essentially control the pop culture franchises that make up our common experience. The chart doesn't really represent ownership as much as it represents control. New Line Cinema doesn't own The Lord of the Rings, only the film version. And Harper Collins doesn't own Tolkien's novels, only the publishing rights. But when you see how much these six companies control, it's clear why copyright and digital rights management have become major issues and why the United States is leaning heavily on other countries, including Canada, to write legislation to protect U.S. corporate assets. The chart is also incomplete. Notice that while Disney is listed, none of the drawn animated characters are on this chart. Neither is Nickelodeon or CBS (both Viacom companies), though Cartoon Network makes it. That just shows that what's here is only the tip of the iceberg. The odds are that if you've bought a book, seen a movie, bought a DVD or watched TV, you've been feeding these corporate behemoths. Cartoon Brew has a photo of Moore I've never seen, Jenny Lerew posts a lovely photo of Moore with his wife Virginia and their infant daughter, and Andreas Deja posts a large sampling of Moore's work. The above is the one Moore from my own collection. Moore is practically a mythical character. His influence is ubiquitous, not only in animation but also in greeting card art of a certain vintage. Because he died before fans and historians could interview him, he's a mystery compared to other Disney artists. His death, often falsely attributed to his alcoholism, has spawned more versions than I can count. He's the Bix Beiderbecke of animation: the flawed boy prince, bursting with a unique talent, who left us too soon. What would we give to have known him? Another Storycorps film from the Rauch Brothers. 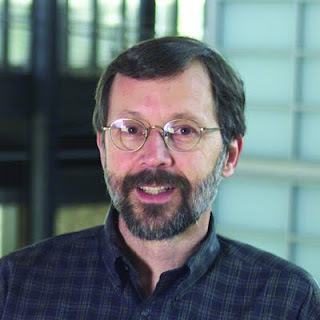 Ed Catmull, currently the president of the Walt Disney and Pixar animation studios, was one of the key people in the development of computer animation. Catmull was and is a software engineer, somebody who developed the nuts and bolts of making animation work with computers. A couple of his early pieces have surfaced. The first, reported on Cartoon Brew, is a film from the University of Utah in 1972. After the University of Utah, Catmull went to the New York Institute of Technology, located on Long Island, where he was involved with trying to find ways of joining the computer with drawn animation. John Celestri has reprinted a paper Catmull wrote called "The Problems of Computer-Assisted Animation." Computer animation has reached a high level of sophistication but it wasn't that long ago that it was struggling to establish itself as a practical medium. These pieces show how far it has come in less than 40 years, all within the working lifetime of Ed Catmull.